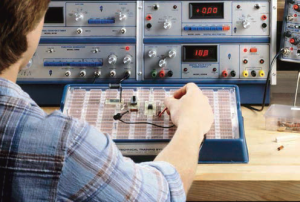 Students planning careers in the electricity/electronics field will find this course particularly invaluable. Virtually all careers require some knowledge of Electrical Concepts, and this course provides an excellent core curriculum. 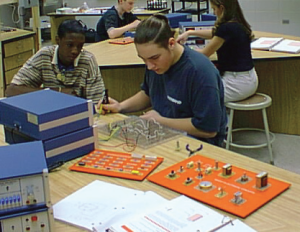 The practical application of concepts is provided by step-by-step circuit building, starting with the very basic circuits and leading to those that are more complex. 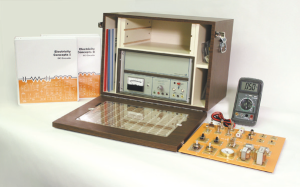 The Model 211SA Training System, “Electricity Concepts I & II,” is complete with laboratory manuals, instructor’s guides, mounted components with storage board, and un-mounted components. 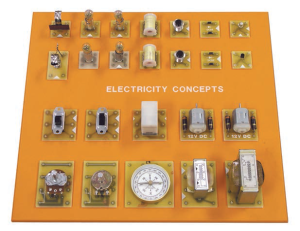 All major components for the 211SA training systems are keyed to a organized storage board. Imprinted outlines of components with schematic symbols permit quick inventory and reinforce student knowledge of schematic symbols. The storage board is color-keyed to the system lab manual.